An NYC family’s Long Island retreat was meant to be an escape. But the original postwar layout didn’t make the most of its location. 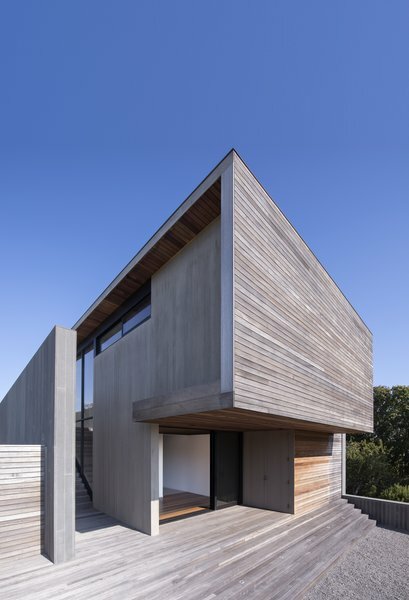 It doesn’t take much to describe the allure of Montauk for a family based in New York City. A couple with a young child were attracted to this storied seaside town on Long Island for its clear differences from their daily lives—the trade of crowded sidewalks for ocean views, and cramped quarters for open spaces, for instance—so they planned to buy a vacation home to use as a ready escape. It’s just that the original property they settled on wasn’t easily linked to its relaxing setting. The east and west facades of the home feature mahogany siding, while the north and south facades are wrapped with bluestone siding. As part of a beach community that’s stood since the postwar era, the home and its neighboring properties were built with a distant relationship to nature. The area’s “steep topography,” as Paul Masi of Bates Masi + Architects describes it, wasn’t touched, and homes were built around it. This, Masi continues, created a disconnect between “the usual flush relationship between a house and its yard.” And for a modern family, that wouldn’t do. 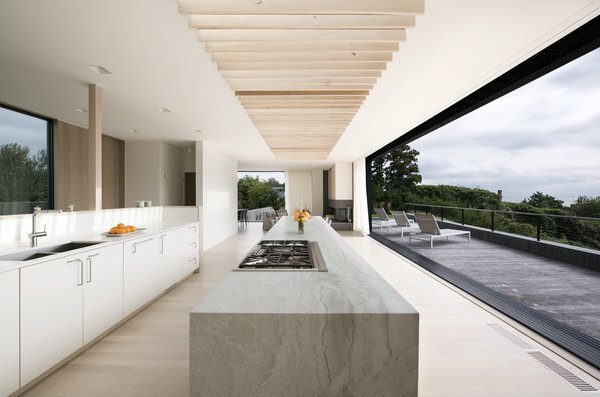 Masi’s main goal was to reconfigure the home so that its indoor spaces had a seamless connection to the outdoors. The oversized entry door and hardware are by Arcadia. “The steep terrain was the main challenge of this project,” Masi says. 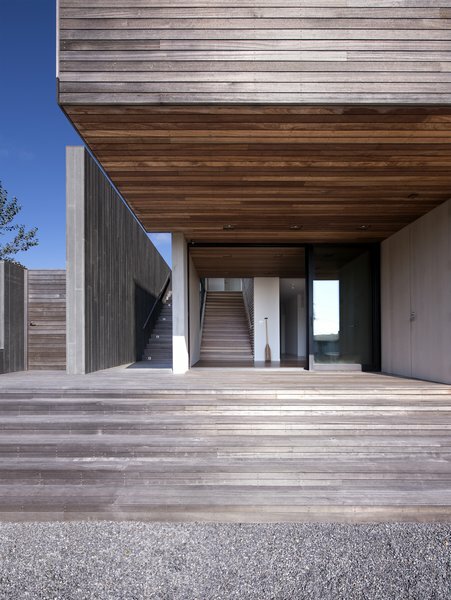 Masi flipped the design of a traditional home and placed the common areas on the second level for the best ocean views. The kitchen cabinetry is custom-made, and a Thermador range sits on the island.